Collagenase clostridium histolyticum (CCH) is an enzyme marketed by Sobi under the name of Xiapex in the UK and by Pfizer as Xiaflex in the USA. From October 2014 it has been approved by the FDA in the USA for use in two cords at the same time. NICE has issued guidance on the use of collagenase in the NHS, it is now allowed for moderate Dupuytren’s disease with a few provisions. The full recommendation (final appraisal determination document) is available for download from our download page. The Scottish Medical Consortium has accepted restricted use of Xiapex in the NHS; the All Wales Medicines Strategy Group has approved the use of Xiapex for treatment within the NHS Wales. The final decision however is with the local CCG who decide at what stage what treatment will be offered on the NHS. The distributors of Xiapex have an informative website that is worth looking at. Collagenase Clostridium Histolyticum can be injected into the cord that has formed in the palm of your hand. The medicine contains special proteins that can break up the collagen fibres in the cord. This weakens the cord, eventually allowing the bent finger(s) to be straightened. 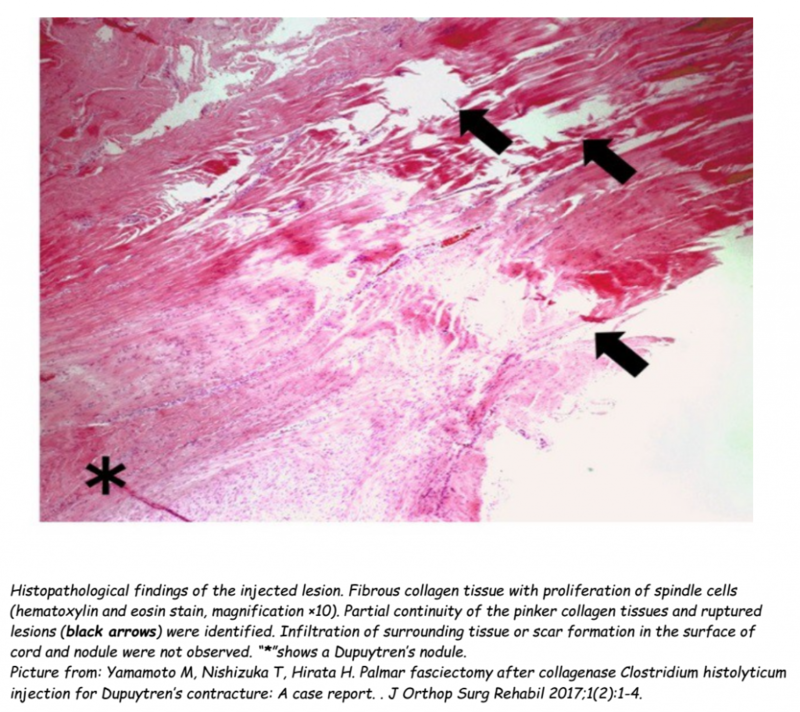 This picture shows a weakened cord with an unaffected nodule next to it. The full article can be found on the publishers website. The injection is normally done on outpatient basis. The doctor may mark the site for the injections so that the enzyme is injected into the cords, avoiding tendons, nerves and other important structures. The injection has been described as feeling like a bee sting. You return to the doctor 24 hours or more after the injection (up to a week sometimes), when under a local anaesthetic, the bent finger(s) are physically straightened and held stretched out for 10 to 20 seconds. This disrupts the strands in the cords and breaks the cord and should increase the range of movement in your bent finger. You should not attempt to straighten your finger yourself within the first 24 hours, or squeeze or press the cord. Keeping your finger bent encourages the injected medicine to stay in the cord which is where it needs to be. If the first injection is not effective, you can have up to three injections in the same cord, with one month between injections. In one study looking into Collagenase Clostridium Histolyticum, nearly two thirds of people could almost completely straighten their finger after the injections. known allergy to the ingredients. There is a risk of anaphylactic shock that the surgeon must be prepared for. These should improve within a week or two. Less common side effects include feeling sick or dizzy, lumps in the glands under your arm, and there have been reports of new Dupuytren’s nodules flaring up. An aftercare leaflet can be found here. Collagenase Clostridium Histolyticum is still a relatively new treatment. There are examples of results from short-term studies, but the long-term recurrence times or rates are unknown. Our treatment links page lists some UK surgeons who have experience treating Dupuytren’s. For more information see the videos linked to here.